Well, this is very surprising! I woke up this morning and found a funny hamster video in my e-mail inbox. A friend of mine thought that it would be funny to train a hamster to spell the name of this website. I am not sure if the hamster is actually trained or if it is all a video editing effect. I have no idea how to train a hamster and I’m curious to know if this is even possible. Are hamsters trainable and are they intelligent enough to do something like this? Watch the video! And leave a Comment Below! Are you looking for dog training classes? Before you spend a dime I encourage you to read more about the different dog training classes available today. Choosing a dog training class is a very important decision that will affect your relationship with your dog. It is important to research your possible options before signing up to any dog training classes. There are three major aspects that you must consider when choosing dog training classes. There is a variety of dog training techniques that are being taught around the world. It is important to know which techniques you will be learning and applying with your dog before signing up to any dog training classes. Usually, the company or school will have information on their website about how they train their dogs. Some dog trainers emphasize on being a strong pack leader and being the alpha in the household. This modern training has been around for the last century and will work with most dogs. But in some cases, these training techniques may involve punishing your dog when he does something wrong. If you are not comfortable punishing your dog or if you are looking for a more humane way of training your dog then you will want to look for “reinforcement training” or “clicker training” on the prospect company or school website. These training techniques involve using positive reinforcements like treats, toys and praise to reward specific behaviors that you like. The second most important aspect to look for is to see whether or not the trainers actually achieved the results that they are promoting. If they say that you can train your dog to do all of the obedience training in eight weeks, make sure that you look at their credentials and see if they have officially won any obedience titles or have achieved credible certification. If you do not see this information on their website then you should ask them over the phone. Another key element that will tell you if their dog training classes are good is by what their former students say about their experience. Usually a dog training company or school will have testimonials on their website. Read them all and see if anybody has had similar problems with their dog as you and if they were able to successfully resolve them. Although the cost is an important aspect of choosing the right dog training classes, it is not necessarily an indicator of how good the company or school is. The best way to find out if a prospect company or school is worth your investment is to call them and to ask them questions. Great dog trainers will always try to help you over the phone even if you haven’t yet signed up to their dog training classes. That is because the goal is to help you train your dog and not to get you to sign up to the class. Once you find a company or school that you feel comfortable with, make sure that you stay within your budget. 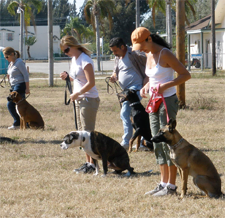 Usually dog training classes begin with one puppy class and will have several grades of obedience training. It is important that you calculate the cost of each dog training class ahead of time to make sure that you can afford it. Overall, the decision on choosing the right dog training classes is totally up to you. If something doesn’t feel right about a trainer, then trust your intuition and keep looking. If you try a class and you don’t like it, ask for a refund. Most companies will honor a refund request if it is requested after the first class.